A 1954 Aston Martin DB3S (estimate $8.4 – 9.8 million) is the leading entry for the Bonhams Aston Martin Works Sale auction on May 21, 2016. This rare Aston Martin Works team car, campaigned by amongst others Stirling Moss, Peter Collins and Roy Savadori is clearly the star entry at this single marque classic car auction. Other early entries estimated to sell for over a million dollar include a 1963 Aston Martin DB4 Series V Vantage Convertible, a 1964 Aston Martin DB5 Convertible and a 1968 Aston Martin DB6 Volante. The Bonhams Aston Martin Works Sale will be held on May 21, 2016 at the Aston Martin Works Service in Newport Pagnell (UK). 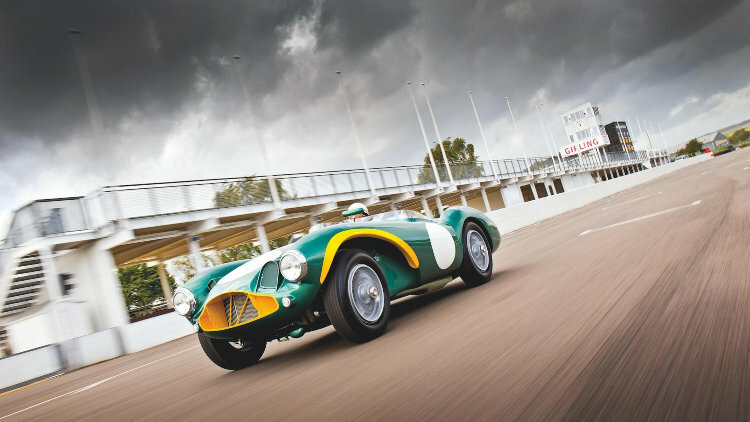 The 1954 Aston Martin DB3S, estimated at £6,000,000-7,000,000 ($8.4 – 9.8 million), is a rare Aston Martin Works team car. Chassis number DB3S/5 was campaigned in period by such legendary racing drivers as Sir Stirling Moss, Peter Collins and Roy Salvadori, and latterly went on to co-star with Terry-Thomas in 1960s movie classic School for Scoundrels. The DB3S originally featured experimental glass fiber bodywork, which was the height of cutting-edge technology for the period. However, after Brown handed it over to the Works team, it was given an aluminum body-shell and upgraded to full Works specification. It never returned to David Brown’s personal ownership, and instead went on to be raced by some of the most daring drivers of the time, in some of the motor sporting world’s most prestigious races. The Aston Martin DB3S later starred in the 1960s British comedy, School for Scoundrels, in which Ian Carmichael battled with caddish (but much loved) Terry-Thomas for the affections of Janette Scott. The movie is a classic tale of one-upmanship, and its plot features several notable vehicles, such as the ‘Swiftmobile’, which was in reality a 1928 Bentley 4½-Liter Open Tourer in disguise, an ex-Works Austin-Healey 100-Six, and – of course – the car driven by Terry-Thomas, named the ‘Bellini’, which was none other than this magnificent Aston Martin DB3S. If the 1954 Aston Martin DB3S sells within estimate, it will be the second highest price ever paid for an Aston Martin at public auction. The record price is $14.3 million paid at RM Sotheby’s New York 2016 sale for a 1962 Aston Martin DB4 GT Zagato – a fine car but without a racing history worth noting.